Henry Worsley was a devoted husband and father and a decorated British special forces officer who believed in honor and sacrifice. He was also a man obsessed. He spent his life idolizing Ernest Shackleton, the nineteenth-century polar explorer, who tried to become the first person to reach the South Pole, and later sought to cross Antarctica on foot. Shackleton never completed his journeys, but he repeatedly rescued his men from certain death, and emerged as one of the greatest leaders in history. Worsley felt an overpowering connection to those expeditions. He was related to one of Shackleton's men, Frank Worsley, and spent a fortune collecting artifacts from their epic treks across the continent. He modeled his military command on Shackleton's legendary skills and was determined to measure his own powers of endurance against them. He would succeed where Shackleton had failed, in the most brutal landscape in the world. In 2008, Worsley set out across Antarctica with two other descendants of Shackleton's crew, battling the freezing, desolate landscape, life-threatening physical exhaustion, and hidden crevasses. Yet when he returned home he felt compelled to go back. On November 13, 2015, at age 55, Worsley bid farewell to his family and embarked on his most perilous quest: to walk across Antarctica alone. David Grann tells Worsley's remarkable story with the intensity and power that have led him to be called "simply the best narrative nonfiction writer working today." Illustrated with more than fifty stunning photographs from Worsley's and Shackleton's journeys, The White Darkness is both a gorgeous keepsake volume and a spellbinding story of courage, love, and a man pushing himself to the extremes of human capacity. 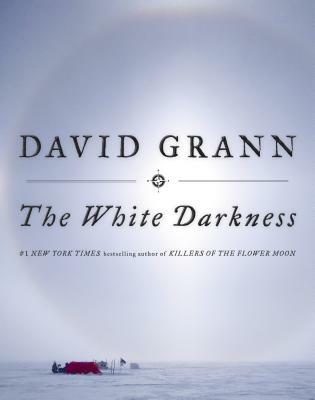 David Grann is a staff writer at The New Yorker and the bestselling author of The Lost City of Z and National Book Award Finalist Killers of the Flower Moon, both of which were chosen as one of the best books of their respective year by The New York Times, The Washington Post, and other publications. He is also the author of The Devil and Sherlock Holmes and The Old Man and the Gun. His work has garnered several honors for outstanding journalism, including a George Polk Award and an Edgar Award. "Grann's prose moves at a brisk pace...with a style that conveys the immensity of Antarctica and the difficulty of Worsley's journeys..."
"A handsome volume...Mr. Grann ably conjures the rasp of sled runner on ice and the skin burn of minus-40." "Grann weaves tales of historic expeditions into his dimensional portrait of the driven Worsley... [He] works his narrative magic on Worsley's adventures, their dizzying dangers, and the 'majestic deathscape' of the Antarctic."